Around the Spiral with Edward Lifegem: Side Questing with Suri Skullshard! I'll start off by saying that this is not a repeat Pirate101 post! I've actually been very busy side questing. :D Lately, I've noticed that I've been behind on a lot of side quests. I always collect any quest I see but haven't taken out time to actually work on these side quests. Over the past week, I've decided to catch up various side quests on my death wizard, Suri Skullshard. 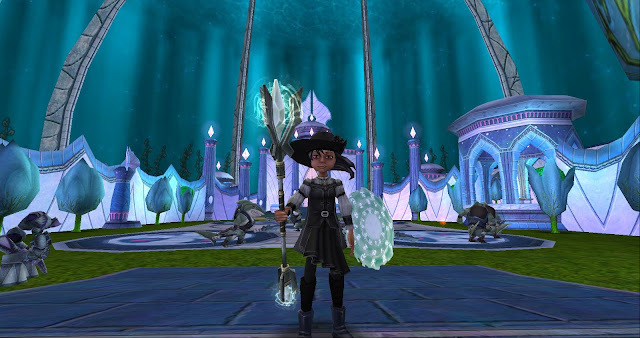 On my last blog post regarding this wizard, I started questing through the Districts of the Stars in Celestia. I completed a few quests in the Districts of the Stars and skipped quite a few side quests. As I've already mentioned, I decided to go back to complete side quests these side quests throughout different areas. Although Suri is currently questing in Celestia, I decided to go back to Grizzleheim and start working on completing quests that I've missed there. The experience points in Grizzleheim are generally low if you're a higher level, but I was still able to level myself up more than halfway by completing quests from Mirkholm Keep to the beginning of Ravenscar. While questing through these areas, I kept imagining what the new graphics would look like. Now, I can't predict the future, but I have a feeling they'll update the graphics in this world. We'll see! Anyway, it was a lot of fun questing through part of this world again. I hope to complete it by this weekend and eventually start Wintertusk. A few other side quests that I've worked on have been a few that I missed in Celestia. The storyline in Celestia distracts me, so I always want to complete the main quests first. I believe I've done this with my other wizards that quest through this world as well. So I've decided that I'm going to complete these side quests as I go. Once I'm done with one area, I'm going to go back to the previous area to complete any missed side quests. I think that'll help me out a lot, especially get my level 58 spell (Skeletal Dragon) quicker! I mean, how awesome is that spell? I guess I should get going so I can finish up a few more quests. Thank you all for reading! Until next time, I'll see you around the spiral.